The Conquest of Mallorca / la conquesta de Mallorca, Palacio Berenguer de Aguilar, 1285-1290AD, Spain. Les pintures murals de la Conquesta de Mallorca provenen de l’antiga casa senyorial de la família Caldes al carrer Montcada de Barcelona, més tard coneguda com a palau Aguilar. Descobertes i arrencades l’any 1961, aquestes pintures de finals del segle XIII són un dels exemples més rellevants de la pintura catalana del primer gòtic o gòtic lineal. Aquest magnífic exemple de pintura de temàtica històrica narra la conquesta de l’illa de Mallorca per part de Jaume I el Conqueridor, esdevinguda el 1229. Com si es tractés d’una crònica pintada, els episodis segueixen la narració detallada en les cròniques medievals catalanes com ara el «Llibre dels Feits» del rei Jaume I i la «Crònica» de Bernat Desclot. A fresco painted by an unknown Arab artist in the Palacio Berenguer de Aguilar. The wall paintings of the Conquest of Mallorca come from the former mansion of the Caldes family, later known as the Palau Aguilar. Discovered in 1961, these paintings of the late thirteenth century are one of the most important examples of Catalan painting of the first Gothic style (or Gothic-linear). This superb example of historical-themed painting tells of the conquest of Mallorca by Jaime I the Conqueror, which occurred in 1229. Like a painted chronicle, the episodes follow the detailed narrative in the Catalan medieval chronicles, the Llibre dels Feits of King James I and the Crònica of Bernat Desclot. 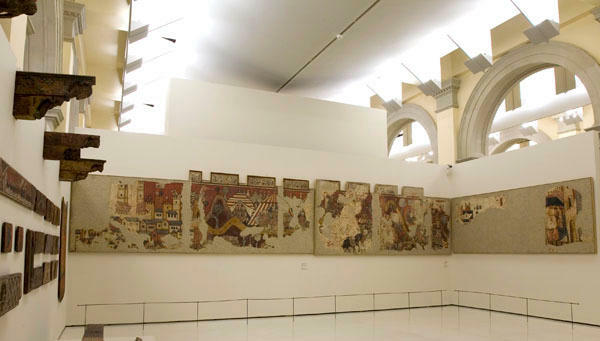 The pictorial representation of the different episodes in the conquest of Majorca by James I, in 1229, formed a frieze near the ceiling in one of the chambers of the Palau Caldes, also known as Palau d'Aguilar. The pictorial cycle begins with the scene of The Court of Barcelona, although the most significant fragments are those of the Battle of Porto Pi, James I's Camp and the Assault on Ciutat de Mallorca. The chief characteristics of these pictures are the artist's sense of narrative and the work's faithful relationship with the historical chronicles. What is more, we must point out the dynamism and the vivacity of the colour. From the compositional point of view, the elevated viewpoint chosen by the painter allows him to superimpose scenes when they are simultaneous events. He incorporates the undulating landscape of the background as an integrating element.